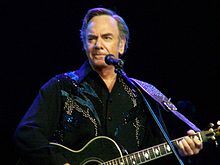 Neil Leslie Diamond (born 24 January 1941) is an American singer-songwriter, who, according to Billboard magazine, is the third most successful Adult Contemporary artist ever, ranking behind only Barbra Streisand and Elton John. I actually wanted to go to medical school. I actually wanted to be a laboratory biologist. I wanted to study. And I really wanted to find a cure for cancer. My grandmother had died of cancer. And I was always very good at the sciences. And I thought I would go and try and discover the cure for cancer. A thing called "Cherry Cherry", was my first big national hit. It was a top five record. And international, as well. And you know, that's what broke the dam. … Boom, as soon as that record hit, I was out on the road. And I've been out on the road… since then. … I didn't realize it at first, but I did want to perform. I liked it. It was fun. You know, I went through all of the growth experiences that you go through in any field. But I did like it. And you know, I've been doing it since. I'm a perfectionist. I like to get it right. I like to get it good. And you know, writing songs is not -- it's not the kind of thing that you can count on every day. You never know what's going to come or if it's going to come. So you -- you know, it's an uncertain kind of a thing. I'm a writer who performs. And I mean, I'm basically a writer. I've been doing it since I was 16. … For me, the balance between the two, the writing -- a year, two years, whatever it takes to do an album, and then you've had enough of writing and thinking and being introspective and all of that kind of stuff, and you want to get out on the road and you want to, you know, get into the physicality of performing. Her eyes would make an angel smile. She'll take a man and drive him wild. And one day I'm gonna make her mine. It's gonna be so fine. And you're a little bit right. And it's a little bit you too. And I love her, God knows, I love her. A solitary man, solitary man. Soon you'll need a man. Shilo you always came and we'd play. But I'm going nowhere at all. Good time with sometime women. Nothin' ain't ever hold me. You can't change me none. Reachin' out, touchin' me, touchin' you. And it don't seem so lonely. And that lame man, he gonna fly. And I fly, yeah, And I fly. Ain't nothing here that I care to take along. To sing when I want. Song sung blue, everybody knows one. Song sung blue, every garden grows one. The blues now and then. You sing 'em out again. You are the words, I am the tune. And I've seen the flame. And I'm sure to be this way again. And I'm sure to see your eyes again. And I'm sure to sing my song again. Such were the plans I'd made. With only words to trade. And here's to the times we used to know. But hard to let them go. Dry your eyes and take your song out. You can still recall the tune. Like you're marching off to war. Like we sang it once before. Time was right, the night was long. The night was long, the time was right. You don't sing me love songs. You hardly talk to me anymore. But it don't sing and dance. But not without a star. Only want to be free. Hang on to a dream. To a new and a shiny place. Make our bed and we'll say our grace. Let it shine wherever you go. In the middle of a young boy's dream. Don't wake me up too soon.